There are so many reasons to celebrate. The Lord gave the Israelites commands to celebrate several times a year. He knew we would need a good dose of laughter, good food, good music, and sharing memories together, to keep healthy throughout every generation. So we did that tonight. 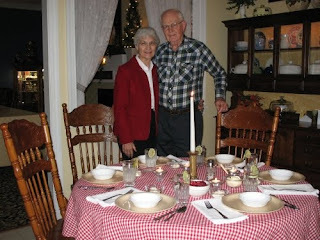 We celebrated our parents’ sixtieth wedding anniversary. We had a candlelight dinner with Paul Burton finishing out our time after dinner by playing his guitar for an hour. It was relaxing for all of us. I got a kick out of Katy having “seconds” of everything. After dinner we went to visit Colin, Jenn, and Annelise. There were more pictures taken and Annelise entertained us making several little facial expressions that were pretty funny. At one point, Katy mentioned that since she is gaining weight she has several pairs of slacks that don’t fit. As if on cue Annelise puckered up her face and whimpered. Katy reassured her that the weight gain was a good thing. We were driving back to our home and Grandmom grabbed Katy’s hand and said, “Oh, Katy, I’m so glad you are here!” Before Thanksgivng they had seen her very sick. So we celebrated a lot of things tonight and it was good! WOW!!! Sounds like you guys are having a ball!!! And it is certainly about time indeed. May I add a small suggestion about the steroids as you continue to drop. When I get to the 20mg drop, we no longer drop by 5mg, as I would go through severe withdrawals. So, when we get to 20 mg, as much as I hate it, I usually drop by 2.5 mg at a time. I only mention this as Katy has had problems with withdrawals from medications in the past. I’m not sure which ones, but steroids can be very unpredictable. Now with that, we will close all talk of medicine, and rejoice in the Lord for all he has brought your family through, as well as the joys he has added to your lives. Again CONGRATULATIONS!!!!! to everyone. What a special event to cherish for many years to come!!! Love the picture of all the women! 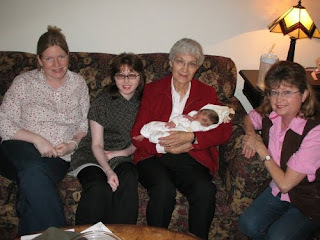 Jenn looks so beautiful and how exciting it must be to hold your great-granddaughter!! This is cause for celebration - so many blessings after so many trials, they are just all the sweeter, I know. Hoping you have a blessed Thursday! Sixty wonderful years! Congrats, Paul & Lucile! 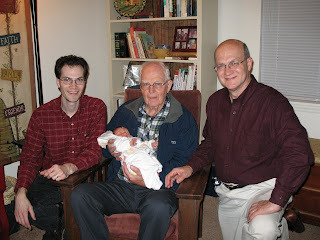 And a wonderful new little great-grandbaby to top it all off!